Closing out 2018 and moving into the new year, I have found myself a little out of sorts. My stomach hasn’t felt right. I have become a tad more introverted. I have been cleaning out, organizing and purging my home like never before. (And not because of the Tidy Up Marie Kondo lady. I read her book years ago and just couldn’t quite get on board. Maybe I wasn’t ready?) I also noticed that I was allowing myself more time and more freedom to become more of me. With these new, collective changes, I wasn’t sure what to make of it. A friend suggested that maybe I was having a mid-life crisis? What? Me? Even though, most likely I am more than half way done with my life, that thought never even crossed my mind. And then one day I was reading some of Brene Brown’s work and it hit me! She wrote that “Midlife is not a crisis. Midlife is an unraveling. She goes on to share that a crisis is an intense, short-lived, acute, easily identifiable, and defining event that can be controlled and managed. Why yes! Yes it is! The permission I have given myself to slow down. To purge my home. To let go of expectations handed to me. To even let go of furniture and china and Waterford crystal that I never have used, but somehow felt obligated to keep. All of this has created so much uncluttered space. Not only in my home, but in my head and heart as well! And as I have been ridding my home of things that are not “me”, it has allowed space for things that are. As I am shedding off false expectations of all the things I need to be for so many people, it frees me up to walk in my giftedness and embrace who I am. I now enjoy being in my home, with less items in it. And I love everything that remains. And, I love this freed up space inside of me that allows room to grow my perspective, expand my knowledge and increase the ability to love well. 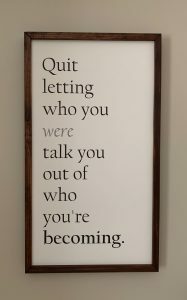 That’s what I have come to find happens when you stop letting who you were get in the way of who are becoming. Good thing I made room for this reminder…. The midlife crisis is real!! It ugliest form is not confused with cleaning out a fresking closet! !